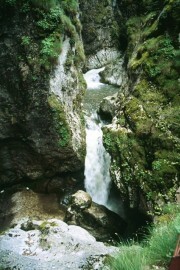 Devil's Trail is located in the Rhodopes, Borino. Construction and related to natural potential, which has left the flow of the river. Buinovska. He has studied and researched targets eight years. Attractive natural composition representing a combination of waterfalls, rock formations, waterfalls, rock wreaths and erosion boilers make the area unique. Devil highland trail will pass a popular hiking attraction here. All this is thanks to BARET (Bulgarian Association for Rural Tourism), which develops the concept of this type of tourism product. With the realization of the idea of ​​the Devil's trail, the local population Borino hopes to become a worthy center providing raznoorazni tourist services. Access to the trail is the most safe and comfortable from the village of Borino and more precisely - near the former mechanical plant room Caaka. Southeast of the village parking from where the south can go on marked trail. After a kilometer away is reached coniferous forest. When you reach this point you remain little - only 1000-1300 meters to the rock phenomenon. The path that goes secured, has arranged shelters of wood to rest. The bridge itself is a rock arch carved by the waters of the river. Caaka gully for millions of years. The bridge is 18 meters high, the scale is 3 4 meters thick, and the hole is 6 meters. 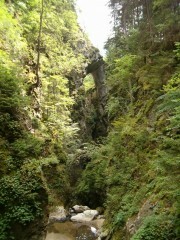 The bridge reveals gruesome views of sections of the gorge of the river Caaka gully. After him in the direction of the river reach a wooden gazebo that is good is your final point. From there follow down two waterfalls with difficult access and is risky unless the traveler is not specifically prepared.